Subsequent to my recovery from Parkinson’s, I continued writing of my experiences on my blog. Many people contacted me from around the world, and I began coaching them in my recipe for recovery and methodology of recovery. One has achieved symptom free recovery already. Below is a sampling of what some of these Parkinson’s sufferers have to say about their experience doing the Recipe for Recover and being coached by me. June 6, 2017: TONY C. IS SYMPTOM FREE HAVING FOLLOWED THE PARKINSON’S RECIPE FOR RECOVERY® FOR TWO YEARS!!! At the end of May in 2015, Howard received an email from Tony’s wife. It was a passionate plea on behalf of her husband who was 44 years old and had Parkinson’s Disease. She explained to Howard that Tony was a natural bodybuilder, no medications or steroids, and “symptoms have gotten to the point where he lays down most of the day and it’s hard for him to work as his work requires physical movements.” Tony had a DATscan to confirm his diagnosis. He did the Recipe and coached with Howard for two years. As his last “proof” of his full recovery, prior to his final coaching call with Howard, Tony went back to his old gym. They were so inspired by his journey in Fighting Parkinson’s, that they presented him with a lifetime membership. And, in a way that only Tony could do, he promptly bench-pressed 250 pounds and did dumbbell curls with 60 pounds in each arm. Click here to read the entire post about Tony’s full recovery. December 21, 2015: HELEN GILL IN AUSTRALIA IS SYMPTOM FREE HAVING FOLLOWED THE PARKINSON’S RECIPE FOR RECOVERY® FOR FOUR YEARS AND THREE MONTHS!!! That is not a typo. On September 22, 2011, Helen found the website and posted her first comment introducing herself to us. Over the years, she and I have become great friends, and many of you have been inspired by her words. Helen often writes comments on the blog sharing her journey. In fact, as you will see below, she even posted a comment to my first November challenge in 2011, stating, “Yeah to everyone I am in for November too!” And now, HELEN IS SYMPTOM FREE!!! Click here to read the entire post about Helen’s full recovery. fightingparkinsonsdrugfree almost a year ago. And that was just the beginning. I made a promise to myself that I would do whatever was necessary and change my life in whatever ways would support recovery, if it was really possible to have my condition improve rather than degenerate. As Howard so often says, ” What did I have to lose?” I trusted Howard as my guide, and the bearer of good news that penetrated the bleakness of my fear and despair . I put my faith in my power to heal myself. The Recipe for Recovery was my lifeline. AND it is why I can happily and gratefully report to you today that the reason I am not accepting this challenge now is that I am symptom free! YES! Symptom Free!!! Cheering you all on as you courageously overcome the disease. I am a happy example of the success of the Recipe for Recovery. Pratima is off of all of her medications and is symptom free from Stage 4 Parkinson’s having followed the Recipe for Recovery for nine months! Hi Howard, It warms my heart to see you constantly reaching out to new people. To any new people. I am 50, have had Parkinson’s symptoms since 2009, was diagnosed in April 2012. I found Howard in June of this year. I tell him regularly he is ” God in Motion” as his love, support and weekly guidance and encouragement is outstanding. The biggest blessing so far, in doing The Recipe is the massive improvement in my bladder and kidneys. I was in a constant state or URGENT need to make it to the bathroom, and had frequent accidents. All that is gone now. I don’t fear going places as I know my bladder can hold off as it used to. There are so many other blessings. There are a community of amazing people here who support eachother through shared low days and good days. For me the Gift is knowing that I am not alone in my vision of a cure and our amazing coach, Howard, always seems to know EXACTLY where our head space is, in his weekly blogs. That Gift is PRICELESS on this journey. Welcome to all newbies. You’ve just found your first major turn on your road with Parky. With you in spirit. Omigosh people…take up this challenge…it’s a magnificent opportunity to take charge of your health and your life…to be proactive instead of reactive. I’ve benefited from increased energy, a more functional digestive system and, most significantly a sense of empowerment and purpose….. instead of victimization, “poor me” etc. Early on, after following Howard’s recipe for a few months, I walked into my massage therapist’s treatment room and he immediately asked what I’d been doing for myself because I looked so much better…particularly my energy (this practitioner also very skilled in energy work)…so I told him about Howard and his recipe and the Qigong exercises. He responded with “Keep it up….you couldn’t be doing anything better for yourself!” I am so very grateful for Howard and his generosity in making this recipe and weekly blog posts available to us all…Howard you are my hero! THANK YOU…THANK YOU…THANK YOU! Thank you so much for this challenge. I have been doing the physical exercise part of the Recipe for Recovery for several months now. It is the perfect program for me. I love life and I love the program. I am not taking any medications. It is so nice to know that I am getting better everyday as I follow the Recipe for Recovery. I do not let my symptoms dictate how I feel I am doing. As Penny said, I have taken charge of my health. For a couple of years before being diagnosed I had suffered from chronic sleep deprivation. As I look back over the last several months, it is easy for my to see how much that has improved. It is so much easier to face any challenges that may come up during the day, when I have had some sleep the night before. Thanks Howard. I will make a list of ten things that I am thankful for each day. I will continue to work on balancing my mind and my soul as well as my body. Thanks to Howard and to each one of you who so freely share yourselves with me. Have a wonderful day! This is really true. Last Sunday Luca and I went for a lovely day in the neighborhood. We had fun and a relaxing day doing nothing in particular. Luca is without medication since diagnosis by choice. In the evening, he was so calm and relaxed without worries about the day after and/or the past, he had lived entirely in the present moment that day and his hand was without tremors in the evening. Now we understand what Howard wrote. If this can be done little by little he will be able to turn it into a way of life and he will re-balance himself and his Parkinson’s will go away because it will no longer have reason to exist in his body! It will not be easy, because he do not live in a vacuum, but little by little it can be done. On monday again he was worried about things to do at work and all the old circus that gives him anxiety, anger, stress ecc ecc and his tremor was there again, but to us this is one of the proofs of the power of the recipe. This is not only a chance to heal, but to change mind and be a better person inside (and outside). And one day, no matter when, Mr P. will go away! We are too deeply grateful to you, Howard.
. . . when somebody asked me how I was doing, I smiled and said “I am doing great!” it was because in my heart I was, in fact, doing great. I knew I was on the right path. I knew that every day I was doing the right things for my recovery. I knew that every day I was opening my heart more to help my dopamine flow. I did not define myself by my symptoms, and neither should you. You are so much more than your symptoms. Bottom line, at the heart of the matter is an open heart . . . which prompts dopamine. And it is not the whole enchilada; the whole enchilada is the Recipe. And the heart of it is this very, very simple idea that Howard expressed so clearly. Thank you, thank you. Hey Howard….this morning was wonderful!…. a cool crisp and beautifully sunny Autumn morning in British Columbia (first morning with below freezing temperatures) …and the first morning in several months in which my body decided to celebrate the day…. walking so much easier…even my usually reluctant left arm was swinging!…how delightful!…. and synchronistic with your request to share celebrations! Happy to be alive and working towards recovery….. thanks so much for these additional helpful exercises…such amazing support! It was a year ago that I took your challenge to do the 30 day challenge in November and I’ve been doing the recipe pretty regularly since the first of the year. I’ve had my ups and downs during the past year but as a whole I noticed that I definitely feel stronger after doing the recipe. I’ve had some discomfort in the area of my gallbladder meridian as I spoke to you about. You told me that it was indicative of energy flowing in that area currently and that my body was healing on the inside. My symptoms seem to come and go as far as severity and I know that I am healing, which gives me motivation to keep doing the recipe regularly. So grateful for your support and the additional information given in this post. I do feel we are pilgrims on the road to recovery from Parkinson’s. Last Thursday I went to Mayo clinic/Jacksonville to have a conference with my neurosurgeon. He is my PD doctor and needs to know what I am doing. I wanted documentation of what is going on with my body. I knew I was improving because I have increased the span of Sinemet from 4 hrs. to 4 hrs. 45 min. And eliminated my last pill before going to bed. Recently in the Mayo newsletters there have been references to Qigong (though I don’t think they fully understand it, but neither do I). So I took those with me; as well as an 8 page supplement on “Mindfulness”. I am 70 yrs. old and have been taking Sinemet for 8 years with increases along the way. I started the Recipe seriously in August. I have committed to every day; but don’t always finish the whole list. Notice the word “try” is not in the above sentence. My feeling is when you just try you don’t make it; purely personal. Well, my friends, my neurosurgeon verified (after going through the usual drills) something positive is going on. He definitely saw an improvement and was ecstatic. He looked like someone had plugged him in and turned him into a Christmas tree. He kept shaking my hand and finally we gave that up and just hugged. The plan is to keep doing what I am doing and let him know when I have increases. My last increase was 3-five minute increases over 15 days. That is what my body was comfortable with. He did tell me there have been cases of Dopamine turning back on; but no one knows why. This statement seems so calm compared to the message I left for Howard when I came out of the office. Still a little leery it will be a super realistic dream and I will wake up. Thank heavens, Howard, has warned us there will still be rough days. I am going to give it my best shot to ignore them. The little book “not always so”, on Howard’s list has been an outstanding aid. One fourth of a pill every other day. So at this point I’m almost off my meds. completely. I know the recipe is helping me to be stronger every day although my symptoms coming go as far as the severity I know I’m on the mend. I am totally committed to being cured from this disease and I will continue with the recipe for as long as it takes. There is no Plan B for me and I have quit searching the Internet for another way. Much gratitude and love for all your support Howard I don’t know what I would do without this plan and the firm knowledge that this is the cure. Howard extends his heart and hand to newcomers. They both hold jewels of information, opportunities and love. From the moment I first saw, and heard, Howard in Cincinnati in June of 2012 I knew this man was the ‘genuine article’. I have always believed Parkinson’s was curable and here was living proof. Howard has such a commitment in helping others. Why not start with your own commitment – 30 days of doing the abbreviated version? Like test driving a car before you purchase it. You have absolutely nothing to lose. Howard offers you a door. You have a choice to walk in or not. If you walk in, do stay for the 30 days, the room you enter is full of wonderful people in various stages of the journey. There’s always room for more. My husband is 47 years old (he does not write directly because we are Italian and he does not speak English and I apologize for my mistakes in advance… ). In June he began the Recipe small step by small step . Since July he performs all Qigong exercises , meditation, breathing. Soon after the diagnosis in May he had been prescribed with Azilect and Requip but he decided not to take it after a strong thinking and documentation and talking with neurologist about benefits and side-effects of meds, so he’s drug-free. He has now full force tremors in the left hand, started with a slight tremor in the fingers of the left hand in January 2013. The hand is also rigid and fails to make some fine movements. He’s lucky now compared to others, we know. What is important is the overall situation which is very good. Fine tune will come! He says he has never been so well (if it wasn’t from the park 🙂 . He was very anxious and had a lot of anger and frustration he is now learning to control and understand making small steps forward every day. Now sleeps very well thanks to acupressure before going to sleep, while before he had severe sleep disorders (wake-up screaming in the middle of the night or fighting with the air sometimes….) and insomnia very frequently. No more constipation in 5 months, sense of smell returned and he is in a good mood , there’s no trace of depression. The left arm started swinging again in August. He knows that his body is healing inside despite of tremors. In the last month I see that he has less fear, fear is going away , even when the hand trembles a lot, he’s not afraid as before. He had some half-day in which the tremor ceased completely and is confident that he will recover, no matter how long it will take. Sometime bad days occur, but they go away and then better days come. Thank you so much Howard, for your support, to have opened a road . You all have to try it, all deserve to heal ! Howard is giving so much to us with this blog, I hope I can help someone to decide starting the Recipe. There’s no side effects this is so important. Just try, is worth it!!! I was on PD meds for 10 years Sinemet 25/100 and Requip 2mg (3x/day). I’m med free since October 19, 2013, started reducing on August 19, 2013. Howard has been a great inspiration and a life saver as well for me. I could not have done this without his help. After 10 years on meds, my neurologist was eager to increase my dosage. My choice were to go along or took action in rid of those meds by myself. So I started by reducing Sinemet by one tablet in the afternoon since afternoon time gave me the hardest time. But end up with Requip that reacting with the withdrawal of Sinemet. So i decided to take both out. then panic set in – i’m on my own. Lucky for me that I came accross Howard’s web site and then follow by attending his workshop in LA. Because of my original mistakes in reducing the meds too fast, my journey had been rough, it took me 2 months to rid of those meds but pay a big prize now with low energy since there was no time to recouperate. The withdrawal had be severe. Without Howard’s encouragement I could not have gone through this recovery journey alone. Howard is committed to our well being and he is always there to guide you and inspire you. I’m on my last path of the journey, I know I’ll fill in the last piece of the puzzle in the near future. My advice is take the challege, don’t do it on your own and follow Howard’s advise. He has proof that PD is curable. And thanks a million Howard. You are the MAN that can help us rid of this disease. What can I say? This Recipe of Howard’s is deep magic. It’s rooted in the profound wisdom that is the source of all love and brilliance. It connects us to the root of all the healing of the universe, turning our minds to the light and bathing our souls in luminosity so that we can see, understand and work through all the hidden stuff (anger, fear, etc.) and develop empathy and compassion, acceptance and the ability, above all, to let go of control and instead surrender so that we can at last start to relax and rest, breathe, and trust that the universe is indeed unfolding exactly as it should! My writing and fine motor skills (doing up buttons, making bows) have returned 70-90%, am standing taller than I have done for years, the right leg shuffle is 80-98% better, the arm swing is intermittent and the tremors less and less–sometimes disappeared. Also, energy and mood are better than they have been for donkeys years: as though I were emerging towards becoming fully alive properly for the first time in my 62 years! Of course, it’s hard, rocky work facing the dark and confronting, and dealing with, erroneous unquestioned assumptions–and in my case sheer laziness too! But nevertheless a very good journey. So rewarding and life giving. I feel so very blessed that you are this wonderful light Howard, so generously showing the way again and again. Thank you! I would just like to say a big thank you to Howard and everyone else who is sharing their experiences. It’s so inspiring to hear everyone’s triumphs and joys. I feel as I am part of a big family that are doing wonderful things together. I have been doing the shortened recipe for a few weeks now and am beginning to smell again. Whopee!! I really missed my sense of smell. I am determined to get better with the support and help of everyone here as well as the most generous and caring Howard. If you don’t have Parkinson’s Disease — at the risk of sounding a little fallacious — run, don’t walk, to read Howard’s blog to see if you could possibly provoke the behaviors that would earn you the diagnosis. Whatever it takes to bring you to serious engagement with Howard would be a gift (dare I say a gift of “peace”) that surpasses all understanding. I’m not sure if Howard takes clients without Parkinson’s, anyone with ANY form of dis-ease — too bad; he should. 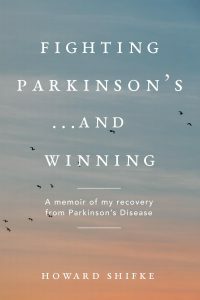 I am so very grateful to you for your generosity of spirit in offering to help people recover from Parkinson’s Disease as you so fully do….and for the support you have offered me personally. I am absolutely committed to the recipe through November and for as long as it takes to recover. As a way of celebrating the value for me of your recovery recipe and your support, I’d like to share some of my experience this past Friday with Nathan, an experienced practitioner familiar with energy work and an RMT (registered massage therapist). I’m imagining that many of you wouldn’t have the benefit I have of independent feedback as to the efficacy of the “Recipe for Recovery”. Nathan’s been working with me for a couple of years …. I presently seek his treatment once a month. Most exciting for me are the encouraging changes he is noticing in my body … this despite the fact that my tremors have become more active recently. First a little personal history: I’m presently 71 years young. Though I was referred to my neurologist in the year 2000 with tremors, my Parkinson’s diagnosis wasn’t confirmed by her until 2005. I’ve never taken traditional Parkinson’s meds (mainly because I had witnessed the negative effect they had on my Mom who also had PD). Instead, I maintained a healthy diet and exercise routine, and explored and practiced alternative methods including Janice Walton Hadlock’s work (no significant improvement after a year and a half). Then looking for more support for a drug free approach to PD, I stumbled across Howard’s website last year. I’ve been diligently following his “Recipe for Recovery” and benefiting from his coaching for the past 15 months. I am blessed with the loving and very empathic support of my husband, Ray. His wonderful presence in my private life frees me to continue with public work that is very meaningful to me as a communications and personal development trainer. After my hour long treatment, Nathan was visibly excited…really animated. He told me my energy was opening up as it never had before…. that the previously stuck energy in my left leg was releasing…that there was much more space in my entire body to move energy, including in my brain. He said that even though my outward tremors seemed more active, that my inner energy was noticeably more calm. Then he said that it was no wonder to him that my tremors and emotions were activated…. there was such significant inner change and energy release into previously untargeted areas, that it would be natural that the body would react as it did. You know, for me, it was wonderful to hear this message ….to know that someone independent from Howard was also echoing the same message that this recovery work is very much like chipping away inside a giant iceberg (very little visible on the surface of things) until the last vestiges of this condition release….until I am symptom free. I’m learning the value of persistence, even and maybe especially through PD flare-ups. So I’m more inspired than ever to continue Howard’s recipe faithfully, tortoise-like, and singing Pete Luboff’s song, “I have the Power”. And as to symptoms sometimes appearing a little worse…. oh well… okay! Must be doing something really good, huh? To all of you who are considering Howard’s 30 day challenge, I can tell you that Howard is more faithful to our recovery than anyone I’ve ever known. I’ve been doing the recipe for one year now and Howard has been extremely helpful and encouraging every step of the way. Why wait any longer? Just do it! You are worth it! It took me a long time to realize that, but I now truly believe it! i daily pray to god thanking him for sending Howard to me. he is a god sent blessing. i consider myself very lucky to have found him . keep reading his blogs and sincerely do what he says and you will get excellent results. all i am asking you is “DON’T GIVE UP”. because you have the power and you all are worth it. i am sure after 30 days lot more names are going to be there with Howard, Mary and Pratima. I ditto all of the comments that others have made. Today, I decided to reduce my pills again. The recipe is helping me recover; it really has helped me on the road to recovery. Penny, What an inspiring story! Thank you for sharing it. I’ve had a similar experience. Previous to hearing about Howard or the recipe I had visited a sacral-cranial practitioner who told me my cerebral-sacral fluid wasn’t moving. I returned to him several times but it didn’t seem to get flowing. About six months after starting the recipe (I started slowly, adding more bits as I thought I could manage. ), I remembered about what he said and went to see him for a check-up. He said the cerebral-sacral fluid was moving just fine; he wondered why I had come to see him. I told him about Howard and the Qigong exercises. I thought he would be thrilled to know, but it seemed in the too-hard basket. I remember last year when Howard issued the November 30 day challenge and I realized that I did not need to do it…..all my symptoms had gone! And they have not returned. I am happier, healthier, more balanced now than I was before I started the Recipe for Recovery, and know that the changes I made to rid myself of my symptoms gave me so much more than that! One of the biggest changes is that the free-floating anger I used to feel is gone. I am not continuously on the verge of losing my temper like I used to be and I think that is mainly because I do not allow myself to remain in stress mode for long stretches. And on the occasions when I do feel angry, now I am so aware of it. I apologize to my liver and ask it to let the feeling go, and not to be damaged by it. So much of what seemed ” out there” to me when I first began the Recipe for Recovery, like having little chats with my brain and my organs, is now part of my everyday life, and I am so much the better for it. You have everything to gain and nothing to lose by committing to yourself and accepting Howard’s challenge and offer of support. It worked for Howard, it worked for Pratima, it worked for me….and it CAN work for you. I have faith that it will. Hope to see you here in Recoveryville soon. I would like to enthusiastically encourage anyone who is feeling discouraged, to please keep at it! I just read Penny’s amazing story from a previous entry— isn’t it exciting? (Penny, you must be on Cloud 9!) In the hope of inspiring someone out there, I’d like to add my story to Penny’s. Howard’s message was introduced to me for the first time at the Parkinson’s Summit in late June. I didn’t even go to his presentation b/c I didn’t believe it was true– I thought he must be some sort of a “snake oil salesman” (sorry, Howard!) After other participants praised him to the skies I decided to visit his website, was convinced, and got started right away. During the month of July I concentrated on getting off the kappikkacchu supplements, eliminating meat from my diet, and learning all the exercises and affirmations. By September I was regaining my sense of smell, which I didn’t even realize I had lost! I smelled a ripe cantaloupe on the kitchen counter from across the room, something that hadn’t happened in years! I work with two-year-olds, and I started to notice when their diapers needed changing! During Oct. I noticed that the rough patch of skin next to my left eyebrow was completely gone, and the rough patch on my left knee was disappearing. I also found out that I can hula-hoop again! When I went out of state to visit my elderly Dad last week after a couple of months, he said I looked fantastic and healthy, much better than I had in July! Finally, yesterday I had a massage, my first since beginning the recipe. The massage therapist said that my left side felt flexible and loose, and that if she hadn’t known from before she would never guess I have PD! This really works! One wonderful aspect of this, to me, is the knowledge that there is plenty of healing energy available to everyone out there– no limitations. It is like the sunshine. If you want to soak up some nice Vitamin D, you have to leave your familiar, safe house and go outside! It is the same with the Recipe– the energy is there, waiting for you. Just go outside and start soaking it in! Congratulations to everyone taking the November challenge. Please post your results so we can all rejoice with you! I started pieces of the recipe while withdrawing from Sinemet, and took the challenge last year to celebrate my first month Rx-free. After I moved into the full recipe , I did go through a period of real fatigue, but figured my body just needed the energy for recovery more than for other activities. A couple weeks later my energy levels were better than they’d been, my sense of smell was back and my balance was normal. People started telling me I looked younger, and I realized I’d lost that lopsided look. About this point I was thrilled with my progress but felt like I was missing something and began coaching. Howard is helping me make true sense of the mental, emotional work in a way I wasnt getting by reading and thinking. I know I still am a work in progress, but a much happier one! I hope that anyone thinking of trying the recipe will just do it. I know you will be amazed at the results, at the feeling of sweet energy moving in you, whether you do it all “right” or not (believe me, I didn’t). Please, please, just do it. After reading this blog, I decided to respond about what has been happening with my recovery. I was diagnosed with Parkinson’s Disease in February, 2012. I am feeling better day by day. As you know, I have reduced my medication from 3 pills per day to 1 pill per day which I will reduce again soon. I have been getting less of the rough days and less severe. I have been doing the Recipe for Recovery since May, 2012. I was fortunate to find Howard on the internet soon after I was diagnosed. I hope to be fully recovered soon. Hooray, Leo! I’m excited that you were able to have a vacation without pills! I took my last Mirapex last Saturday and I’m still functioning! Imagine that! Faith and a positive attitude make this battle easier…and a SMILE! I am smiling with you, Leo! We WILL recover! Thanks for posting those comments. It really helps knowing that there are others out there working the recipe and getting results! I have good news! I saw my neurologist yesterday for the first time since starting the recipe and getting off my drugs. I was very anxious about seeing him. I was afraid he would be very negative about my plan to follow the recipe. I had several people praying for me and I prayed your prayer about handing over my negative thoughts to God. It worked! I was very positive, and even bubbly during my appointment yesterday. I have been participating in a study during the last year. Part of the study was to complete a questionnaire and go through a battery of tests. After my tests yesterday, the examiner commented that my results were better this year than last. My comment was: “isn’t that interesting, since I am not on any medication right now?” That gave me the boost I needed to tell the doctor what I was doing. He was fine with my plan to fight this without drugs (for a while at least). So now, all systems are go for me. I am committed to working the recipe and to RECOVERY! I’m not there yet, but on my way! •	HEIGHTENED SENSE OF SMELL – I’m picking up smells that even my husband is missing – did you know that an Amaryllis has a beautiful fragrance?….well, I didn’t until I selected one for Christmas this season! •	ABSENCE OF CONSTIPATION – need I say more?…anyway, a significant improvement over the last few months. •	HEIGHTENED AWARENESS OF JOY IN THE MOMENT – I am noticing more and more that I’m truly moved by natural beauty… truly able to celebrate with heightened joy all of nature’s beauty – I’ve always loved it, but think my enjoyment was clouded by PD onset depression. More and more I’m reveling in the beauty of early morning sunrises, the ghostly movement of morning mists over farmlands and forests, the song and flight patterns of birds (including the magnificent trumpeter swans who have just arrived to winter here), the sight of deer and cows and sheep on nearby pastures …. Omigosh, I am truly, truly blessed. •	REDUCED STRESS RELATED TREMORS AND RELATED PAIN – I had stopped watching hockey games on TV because the excitement was too stressful for me….PD would flare up…. tremors and associated pain so significant I was unable to enjoy the game. This was tough for me (I’m a Canadian, eh? )….Now, and for almost 2 months I’m once again able to watch my beloved hockey game without these flare-ups…Go Canucks, Go!!!! After I was diagnosed with Parkinson’s disease in September 2010, I began researching everything I could about the disease and realized that taking the medications was not the path I wanted to go down. I came across Howard’s blog in late October, 2010, and I read every single entry with amazement and hope. His words resonated with me that I could overcome this drug-free. In November I contacted Howard and thanked him for his blog, and he immediately reached out giving me guidance and encouragement. I personally met Howard in December and found him to be as genuine and gracious with his advice as he was on his blog. After I began following Howard’s recipe, I gave Howard statuses of my progress. Howard has responded to my statuses in such a thoughtful and thorough manner, and he has given me targeted guidance for my specific situation. He has explained what is happening with my body and given helpful suggestions, and Howard has given me countless encouragement that motivates me to keep at it. Since I have been following Howard’s recipe, I believe that my tremors have lessoned and that my limping has gone away for larger spans of time. I feel confident that with Howard’s coaching I will continue to get better and better, and I will overcome Parkinson’s. Thanks, Howard, for all you are doing for so many of us! Recovering from PD is no walk in the park. The universal belief is that Parkinson’s is incurable and progressively degenerative. To hold the contrary belief that the body can heal itself and that it is possible to progressively regenerate the central nervous system takes tremendous effort and conviction. How wonderful to find someone out there who has made the passage through PD to wellness. Thank you Howard for lighting the path with your knowledge, experience and positive perspective. You have helped make my journey easier. In the past I’ve been a person who struggles with routine, with doing anything … everyday. Over the last two months I’ve noticed my energy levels creeping up. I can turn my head easier when backing up the car. Mostly my mood has been buoyant …. why? The follow-up. I’m keeping on, not perfectly, but keeping on. Every week I look forward to hearing back from Howard. He keeps me gladly accountable. Perhaps this comes from his gently persevering attitude. Can’t sit cross-legged? Do it in a chair, is a perfect example. In addition he has always been respectful of my connection to my ‘divine power’ which is very important to me. I feel myself getting well. I was diagnosed with PD in December 2010 and immediately began looking for a non-drug therapy alternative. When I came upon Howard’s blog site, I was so excited to find not only the inspirational story of his recovery, but also a detailed account of the healing regimen he created for himself, including easy-to-follow videos of the exercises he recommends. In addition to finding much valuable information on his site, I also found a friend to hold my cyber hand as I blaze my own trail to recovery. From my first email to him I received an immediate response filled with warm support and helpful suggestions tailored to my own situation. He has continued to accompany me on my journey and I consider Howard a valued member of my recovery team. Howard is to be commended for putting his personal reputation on the line by proclaiming his full recovery in a world that considers this disease to be incurable. His altruistic intent to help others is clearly apparent and heart-warming and he is providing a wonderful service for which I am truly grateful. Howard Shifke is the poster child for Parkinson’s recovery. Sharing his story of faith and determination while in the darkest throes of Parkinson’s makes me keep working hard towards my own recovery. His prayers and positive affirmations have been a source of great inspiration and when I feel like I just can’t do this anymore, I go back and re-read them and once again my deflated balloon of hope fills up full and I can face the day again. Howard is a light shining in the darkness. Thank you Howard for sharing your priceless gift of recovery! Howard’s remarkable recovery has been an absolute inspiration. And his willingness to share his experience with all who are suffering with PD, shows all of us what the power of a clear mind and an open heart can achieve. I have benefitted greatly from Howard’s kind help on my road to recovery, and I’ll always be grateful for his guidance. Since five years I am living with Parkinson’s drug free, and the development of my symptoms is partly getting better and partly getting worse. I had great support from the Internet and at this point I want to thank you Howard for your exceptional supportive information that you share on your blog. Further I got very much help by your Emails which gave me individual advises on special Questions I had. It is a real miracle that you lost (fighting) your symptoms of pd. And I am very glad to participate in the process – so I can find out what is the way that brings me to lose all my symptoms. Especially the issue of faith I can learn from you and will be glad with further support. I hope very much you will go on to offer your exceptional experience for those you trust more themselves than a corrupt mental health system. Howard’s recovery plan is a methodical approach constructed on the tenets of Traditional Chinese Medicine. Through it he has achieved the ultimate goal of renewed health when Western medicine said it couldn’t be done; he has proven otherwise. Howard has created hope where it didn’t exist. He has done this without expensive treatments or complex and painful therapies. Though the road is not an easy one, it offers hope to those of us with PD. When one realizes they didn’t just wake up one day with PD, they realize it developed over time due to imbalances. Which specific imbalances we may never know. However, Howard’s recovery marks a shifting of the modern day and long held paradigm that PD is incurable and addresses these imbalances. I have found a wealth of knowledge and wisdom woven into Howard’s research and experience. Additionally, he has been helpful and encouraging in his responses to my many questions. I continue to follow his “recipe for recovery” as it offers the only long term hope for PD sufferers. Imagine my excitement when I discovered Howard’s blog – someone who has actually recovered from Parkinson’s, and with natural healing methods! And not just writing about it, but offering incredible detail as to theory, methods and practices–a complete “recipe” for recovery. Howard’s story and writing are thoroughly imbued with hope and inspiration. I immediately wrote Howard to thank him – and, of course, ask a few questions. I found one of the most patient, understanding and helpful people I have ever met –a true healer, dedicated to helping others. In the months since, I have written Howard to provide updates and ask advice numerous times. His replies are, without fail, timely, detailed, helpful and brimming with goodwill and encouragement. Howard’s website and coaching are an incredible resource for Parkinson’s patients, the world over.